A few photos of the New Year celebrations! One hour left of the year 2016 and I'm hanging out with Ebba the dog. Why people still find loud explosions and bright fire works to be exiting is beyond me and I'm sure most animals share this question with me. We have had constant loud noises since 6pm from the neighbouring villages and it's getting worse. The television has been on all evening blocking out as much as possible, but Ebba does not seem to be bothered by all the noise pollution, which is a blessing. Now it's time for this household to go to bed and hopefully Ebba will carry on being completely cool about it all. Our young hens decided that Christmas Eve was the right day to start their egg production. Small, beautiful eggs are now to be found all over the stable and once again our dear sheep get pecked in their noses while trying to eat their hay. Monty still only has eyes for our three guests so all this new activity is going right past him. We miss dear, sweet Mr. Chip and remember a time when there was no dog jumping over furniture. We are keeping our fingers crossed for our friends, the otters, and wishing them all the best at their fishing course. We wish this New Year will come with a bit more sanity, world-wide and that peace will once again find it's way into people's hearts. We remember dear departed friends and send them all our love, up to those clouds in heaven, where they sit and rest. We also remember friends and family, nearby and far away. It’s New Year, a new beginning and yet so much is the same. That's the way animals like it and that is good enough for us. Be well, be safe and be happy! 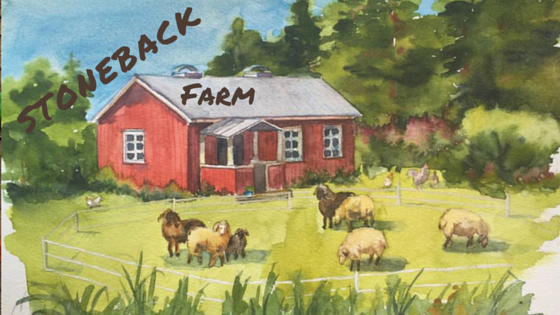 Love from all of us at Stoneback farm.